Mining giant Lonmin has dropped its threat to fire miners who failed to return to work at a South African mine after deadly clashes last week. 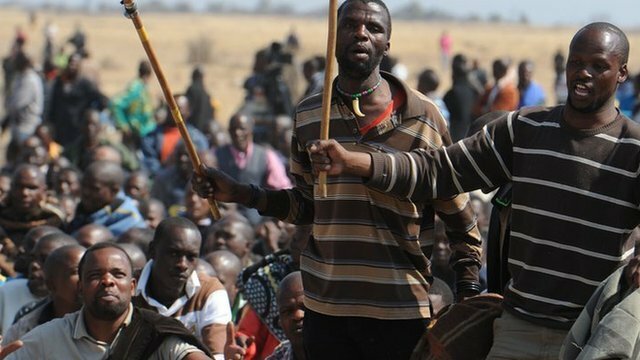 Lonmin’s decision came after the government appealed to the firm to drop its ultimatum to sack workers if they failed to end their strike by Tuesday. Last week, police shot dead 34 strikers at the Marikana mine. The South African parliament is due to debate the killings on Tuesday, amidst a national outcry, reports say. South African President Jacob Zuma has a declared a week of national mourning and has promised to appoint a commission of inquiry into the shooting. Mark Munroe, Lonmin’s executive vice president, said firing thousands of workers would not necessarily ease tension. “I don’t think it’s going to contribute to a more stable environment if Lonmin goes out and puts deadlines and ultimatums and says we will fire everyone if no one comes to work,” he said. A minister in Jacob Zuma’s office, Collins Chabane, said Lonmin had agreed to suspend its ultimatum in talks with the government. “I think we need to try to temper the flare-up of emotions on all sides and try to find a reasonable solution to address the problems,” he said on local radio, AFP news agency reports. Senior opposition party members visited the mine in North West province ahead of a special parliamentary sitting that will debate the incident, South Africa’s Mail and Guardian newspaper reports. “We have heard the workers concerns and we have familiarized ourselves with the situation. We will now be in a better position to ask the right questions in parliament,” opposition United Democratic Movement (UDM) leader Bantu Holomisa is quoted as saying. About 3,000 rock-drill operators (RDOs) walked out more than a week ago in support of demands for higher pay. The strike was declared illegal by Lonmin, the world’s third-largest platinum producer, and the mine was shut. Clashes between strikers, some holding clubs and machetes, and police culminated on Thursday when officers armed with automatic rifles and pistols fired dozens of shots. The miners, who are currently earning between 4,000 and 5,000 rand ($484-$605) a month, say they want their salary increased to 12,500 rand ($1,512).